This week, the Big 12 microsite will finish previewing each of the league’s 10 teams. Today: West Virginia. Where We Left Off: We left off with a year West Virginia hadn’t experienced since legendary coach Gale Catlett’s 8-20 nightmare of a season in 2001-02. While last season’s edition of the Mountaineers won 13 games overall, it felt like eight games considering the success the program had achieved over the past decade. Kevin Jones and Darryl “Truck” Bryant, two integral pieces of the school’s run to the Final Four in 2010, graduated after the 2011-12 season and it seemed their leadership on the court left as well. The responsibility of team leaders fell on the broad shoulders of upperclassmen Deniz Kilicli and Aaric Murray, but their combined struggles on and off the floor set an ominous tone for a team that couldn’t seem to straighten themselves out. 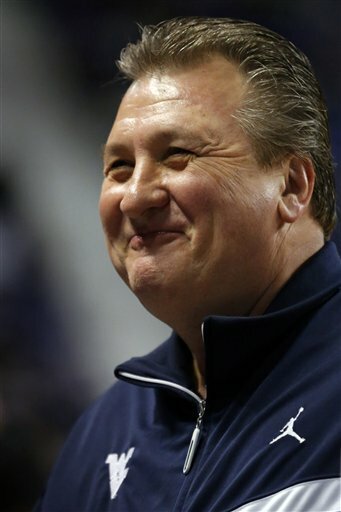 The .462 winning percentage in 2012-13 was the worst ever at the Division I level for WVU alumnus Bob Huggins. Positives: One big problem for WVU last season was scoring, but three of the team’s top five scorers are back for another season. Eron Harris was a precocious freshman who didn’t see consistent playing time until conference play, but when he did play he took advantage of the opportunity, leading the team in scoring at a modest 9.8 points per game. The pressure will be on the sophomore Harris to become this year’s go-to scorer. Terry Henderson is back for his sophomore season as well after developing into a threat from behind the arc last season (40%). More will also be asked of Juwan Staten, who transferred over from Dayton last season and now assumes the responsibility as the team’s starting point guard and defensive leader. Another positive is for Bob Huggins to start fresh this season. The leaders of the team are mostly sophomores and juniors, and if you’re a guy with the pedigree of Huggins, you’ve got to feel better about your team winning more than 13 games this time around. Negatives: And yet as I make that point about the underclassmen, that could be his team’s eventual undoing. There isn’t a single senior listed on the roster and two of the five juniors are JuCo transfers. How will this young core deal with adversity? While Murray and Kilicli may have disappointed in their WVU careers, at least they were somewhat intimidating forces in the interior. Their departures leaves a gap that could be filled with an unknown commodity in JuCo transfer Jonathan Holton. He had solid numbers as a freshman at Rhode Island, averaging 10.2 points and 8.1 rebounds, followed by 17.5 points and 14.1 rebounds per game while shooting 39.6% from three-point range at Palm Beach State Community College (FL) last season. But that sure is a lot to expect from one guy needing to replace the production of two players. Best-Case Scenario: The team has to stick together, first and foremost; but if the Mountaineers find a way to glue all the pieces together, an at-large bid could be in their immediate future. This happens only if Harris takes charge offensively, Henderson knocks down jumpers, Kevin Noreen and Horton patrol the paint and Horton performs like the 13th best junior college prospect in the country. Staten will also need to be an outstanding distributor of the basketball. Most importantly, though, it starts with team defense. Last year’s team allowed opponents to score 68.1 points per game as opposed to its Final Four year (63.5 points per opponent). Even if their offense isn’t rolling at high gear, their defense can keep them in more games than not. Worst-Case Scenario: We see a carryover from last year’s team, the same team that allowed more than 75 points to nine different opponents. The team that’s not willing to grind out games with their scoring troubles. Maybe Elijah Macon never suits up in a Mountaineers’ uniform. But another bad season should not put Bob Huggins on the hot seat. For everything he’s done for his alma mater, could it get so bad that the athletic department starts to look in a different direction? The rumors are that West Virginia’s current athletic director Oliver Luck is interested in the Texas AD job. If Luck does leave Morgantown next spring, could the next regime have less patience with Huggins? That’s a question I don’t feel comfortable answering. Reserves: This could be an evolving rotation of reserves to start the year. Huggins will have Elijah Macon ride the bench, and that’s assuming he’ll be eligible at some point in the season. Gary Browne, who has averaged about 20 minutes in each of his first two seasons, is another option Huggins could go with at one of the guard slots even though he’s not much in the way of offense (32.5 percent from the field). It will be intriguing to see who emerges between freshmen forwards Brandon Watkins and Devin Williams for valuable minutes as well. 11/12 at Virginia Tech: Times aren’t great for WVU’s neighbors to the east either. The Hokies are also coming off a 13-19 season in which they lost all those games with superstar Erick Green, a 25 PPG scorer who has since graduated. Another footnote: This game will be played during ESPN’s 24 Hour Tip-Off Marathon. Weekday afternoon hoops FTW! 12/5 at Missouri: This was the Big 12 conference game that never was, but it will be a part of this year’s edition of the Big 12/SEC Challenge. This also marks Bob Huggins’ first trip to Mizzou Arena since January 2007 when the then coach of the Kansas State Wildcats walked out with an 85-81 win. 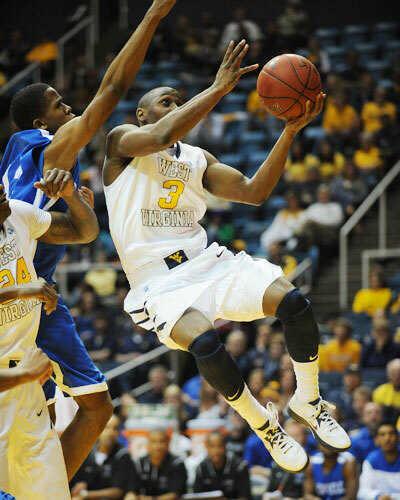 12/10 vs Gonzaga: Speaking of the Tip-Off Marathon, the 2012 edition started off with West Virginia-Gonzaga. The Bulldogs put a thorough beatdown on the Mountaineeers and now the Zags will have to deal with traveling coast-to-coast to play a game. This has trap game written all over it and if the Mountaineers are good enough to grab at an-large this March, getting this game is an absolute must, specially when it is in their own backyard. Outlook: If last season’s 13-19 is a negative extreme and a potential at-large is the other side of the coin, then a likely destination for West Virginia is to finish at the .500 mark or possibly two or three games above it. There’s a lot to overcome here — a slew of young players, new pieces, a lack of demonstrated defense, a lack of proven scoring, etc. What hinges on their success above all is their commitment to defense. It’s a hallmark of Huggins’ long career in college hoops. If we get an encore of last season in Morgantown, though, we’ll start to see how long Huggins’ leash really is. This entry was posted on Monday, November 4th, 2013 at 4:01 pm by Nate Kotisso	and is filed under big 12, microsites. Tagged: bob huggins, brandon watkins, devin williams, Elijah Macon, eron harris, jonathan holton, juwan staten, kevin noreen, terry henderson, west virginia mountaineers. You can follow any responses to this entry through the RSS 2.0 feed. You can leave a response, or trackback from your own site.